The Mariinsky Theatre Trust is grateful to BP for its nine-year support of the Mariinsky UK touring programme. This partnership builds on the strong relationship already established between BP Russia and the Mariinsky Theatre in St Petersburg and forms part of BP's cultural programme in the UK. The Mariinsky Theatre Trust has been ground-breaking in the world of arts support organisations. Created in 1993 by Valery Gergiev, the Trust combines practical assistance for the Mariinsky Theatre’s work in Russia with active promotion of its most innovative programming in the UK. 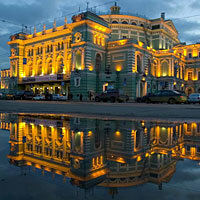 The Mariinsky Theatre Trust is the working name of the Anglo-Russian Opera & Ballet Trust, a company limited by guarantee.